Facebook has announced this week that its location-based service Places has come to the UK. Places first arrived back in August in the US and the more eagle-eyed of you will have spotted that there has been a dormant link to it on the UK Facebook iPhone app since then. Its arrival in the US sparked something of an outcry from privacy supporters who felt letting others know where you are at any given moment could turn you into bait for stalkers. But that was last month, which means we have had a bit more time to digest just what Facebook Places means to everyday users of Facebook and not just fan the flames of the privacy debate. It's all very well speaking to your mates online or liking their status updates, but it isn't as good as meeting up face to face over a drink or two. 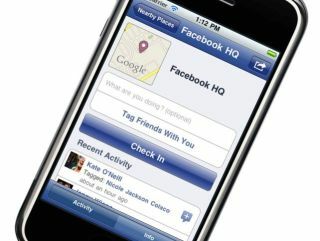 Facebook Places allows you to do that, keeping track of where your friends are. If you spot that someone goes regularly to a certain café, then it's probably because they really like the place – or they fancy the waitress. Places opens up where you live and may offer different places and things to see and do. This is similar to what Foursquare has done, but changed going to places into a game of one-upmanship. Twitter's explosive growth isn't just to do with the amount of celebrities using the thing but because it is so easily accessible from a mobile phone. Facebook has gone some way to improving its phone apps, but the service is still primarily looked at on a computer. Places gives the mobile phone version of Facebook a massive USP – it means that there is now a reason to use the social network on your phone as well as your desktop. It's fair to say that most of us don't actually meet up with the majority of our friends on Facebook. Some may want to keep it that way, but Places is focusing on the ones who wouldn't mind meeting up with real people once every so often. So, if you sign up you will be notified if a person is in a similar area to you. This could also act as a warning if you definitely don't want to meet up with a particular person. If you are going to a place you have never been before and someone on your network has been there, Places allows them to offer travel advice, recommendations and the like.